Rather than bore my readers with a day-by-day travelogue, i’ll just provide highlights of the Great California Desert Tour i took Rina on. 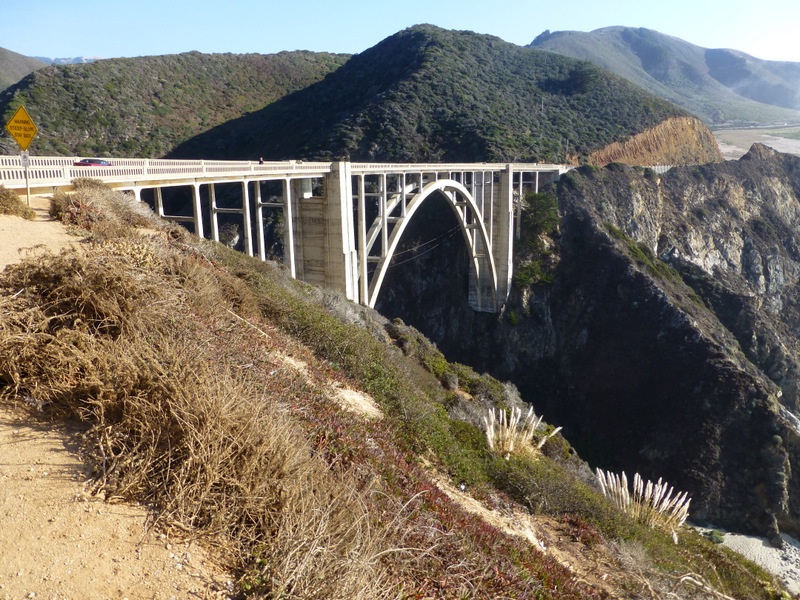 Rina had not seen the stretch of CA-1 between Monterey and San Simeon, so even though it wasn’t desert, it was a must since i think it’s the most beautiful part of the California coast. She drove us down I-280 and US-101 past Gilroy to Salinas, where we left 101 to give her a taste of a typical little American town and stopped for lunch at a typical little American small town restaurant. Might as well go ahead and be upfront about it here, there’s a hidden agenda. This is Rina’s third visit, and during the previous visits my focus has been on showing her the loveliest parts of the Bay Area. This time i wanted to show her more beauty, but i also wanted to show her some ugliness, some of the real America. Obese men driving giant pickups with headache racks and NRA bumper stickers. Dirty roadside cafes with bad coffee. Little dried up towns with half the buildings either boarded up or tumbling down. The pity is, i can’t take her back to Kermit, TX to score all those in one place. But anyhow, the restaurant in Salinas was a bit of a disappointment, first because the waitress was a delightful woman from Iceland, and no, i don’t mean Iceland, Kansas. In the second place, the food was actually good. Oh well, maybe next stop. And no, we didn’t get into what an Icelander was doing in Salinas as i suspect it was a long story. At Monterey i took over the driving so Rina could enjoy the view of the coast from the ideal position, the passenger’s seat headed south. You know, so as to be able to peer over the edge of the cliff at the Pacific crashing into the rocks far below. 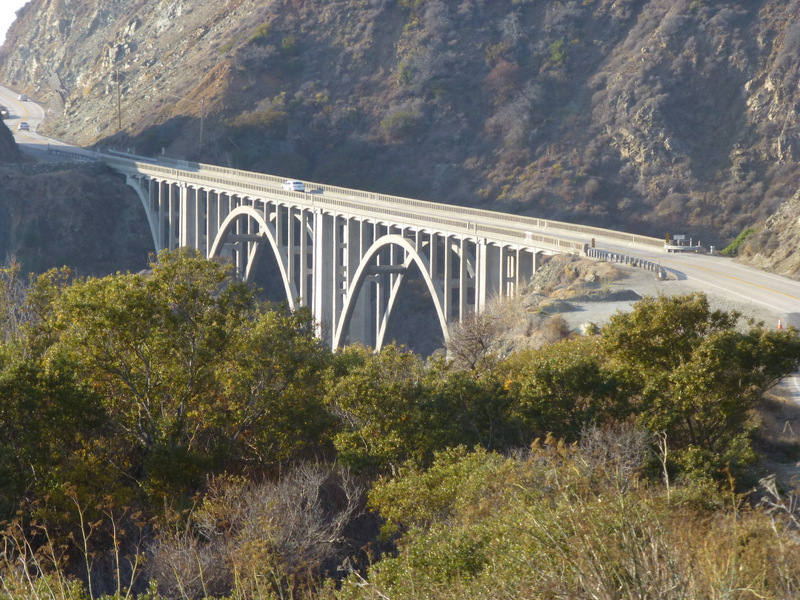 This time i finally had the sense to do a little preparatory research and thus knew when i was approaching the Bixby Bridge in time to catch the pullout at the north end. And this one, further south and also handsome but i neglected to write its name down. 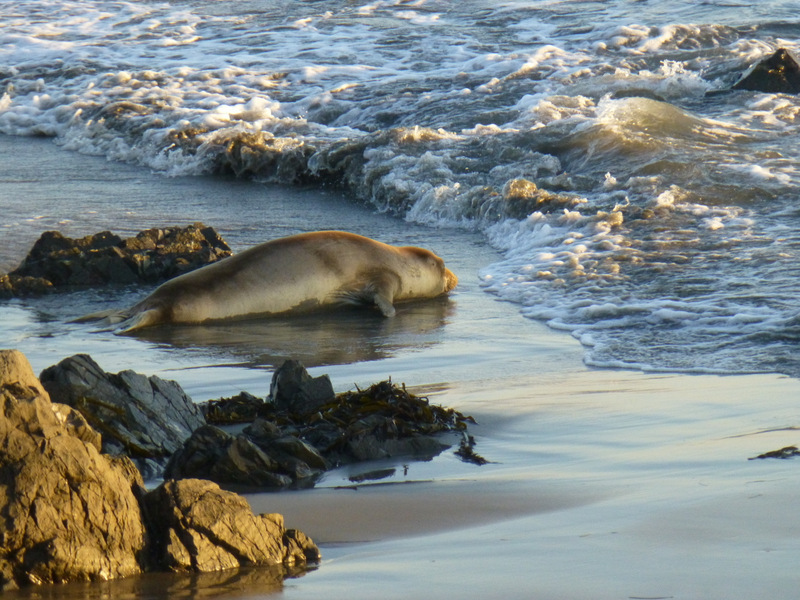 And finally, as we approached San Simeon we spotted a pack of seals on the beach, and i caught this one making a break for the water. And so to bed at the Courtesy Inn in San Simeon, very comfortable and reasonably priced. Well, bedtime didn’t occur until after a truly dreadful dinner at a place across the highway that i wish i’d written down so i could warn everyone. I ordered the meatloaf dinner, thinking meatloaf couldn’t be ruined. I was wrong.